Looking for a dentist in San Marcos CA? At Smiles of San Marcos, our privately owned Dentist in San Marcos, CA uses a blend of gentle care and modern efficiency allows us to provide patients with comprehensive, personalized dental care. 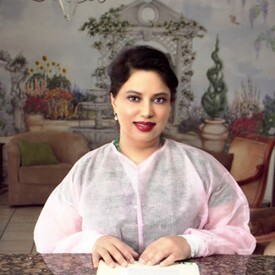 Our San Marcos, Ca dentist, Dr. Rasika Jain, is committed to delivering state-of-the-art treatment with your comfort in mind. We offer solutions to strengthen dental health, function, and appearance. Dental implants are used to replace missing and broken teeth. Broken teeth can get infection, causing pain. They negatively affect our ability to chew our food. They are also an aesthetic problem. This is why it is important to replace missing and broken teeth. Dental implants are a permanent solution for replacing missing and broken teeth. Affordable Dental Implant package: $2495 --- custom milled abutment, a Zimmer implant and a zirconia-lava crown. We offer 60 month financing oac. Most insurance accepted. Same day/evening appointments available. SCHEDULE YOUR COMPLIMENTARY CONSULTATION TODAY!!! A dental implant is an artificial substitute for a tooth root that the dentist puts in the bone. After a period of integration the dentist then places a crown over the implant. Depending upon the torque obtained at the time of placement of the implant you may take impression for the crown the same day or wait 3-4 months. IMPLANT SUPPORTED REMOVABLE DENTURE: This involves a removable denture supported by implants and locator abutments. While the denture is still removable it gives it a much tighter fit and allows you to eat foods you typically cant eat with dentures such as nuts, broccoli. It avoids the embarrassment of dentures coming loose in a restaurant. ALL ON 4:This is the ultimate replacement of all missing or broken teeth. With this you get a fixed teeth supported by 4 implants. You can smile and eat like your teeth. This the one you see in all the clearchoice commercials. We believe that effective care should be accessible to patients of all ages. Our goal is to provide families with the comprehensive treatment they need. 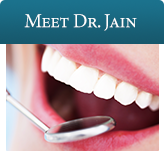 Beginning with preventive services such as sealants, fluoride, and periodontal therapy, Dr. Jain is committed to helping each patient achieve a life of optimal dental health. Cosmetic Dentistry. Dental Implants, Porcelain Veneers, Teeth Whitening. San Marcos CA. Beyond the aesthetic benefits of a straight smile, orthodontic treatment yields a number of functional and health benefits for patients. At Smiles of San Marcos, Dr. Juan Mejia is committed to ensuring each patient receives the right orthodontic treatment for health and beauty of their smile. Dr. Mejia has 28 years of experience in orthodontics. He is experienced with traditional braces and invisalign treatment. He specializes in Tmj cases. We offer a free consultation e to evaluate your teeth, bone, smile, TMJ and bite. Orthodontic treatment involves initial records --- Panoramic radiograph, cephalometric xray, models and photos. 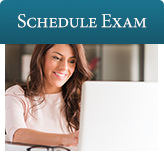 Dr. Mejia develops a treatment plan and reviews that with the patient /parent. For adult patients looking to improve the aesthetics of their smile, Invisalign® offers a convenient and discreet way to achieve your ideal smile. Unlike traditional braces, Invisalign® uses clear trays to gradually shift the position of the teeth into the correct alignment. Invisalign® is most effective when used to correct minor crowding or perform cosmetic movement rather than extensive realignment. As the success of Invisalign® relies heavily on patient compliance, this treatment is often recommended for adults. Similar to traditional metal braces, ceramic orthodontia use a series of brackets and wires to reposition teeth. However, ceramic braces are tooth-colored or clear, providing patients with a less noticeable method of straightening teeth. As they can be used in more extensive cases of realignment and do not require diligent patient compliance in order to be effective, ceramic braces are ideal for anyone looking to improve their smile without the appearance of metal braces. The most recognizable braces, metal braces are an excellent option for patients of all ages. Metal braces can be used to treat a variety of orthodontic issues, making them the most versatile treatment option. As patients visit our San Marcos orthodontist regularly to check-in on treatment progress, adjustments can be made as needed to keep your treatment within the expected time frame. 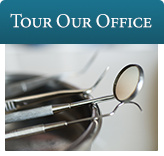 Visit our San Marcos Ca Dentist Today! Our San Marcos CA practice is proud to provide our community and the surrounding areas of Escondido, San Marcos, San Elijo, Vista, Carlsbad, Poway, and Mira Mesa with the dental care they deserve. To learn more about the benefits our services have for patients of all ages, contact and schedule an appointment with our San Marcos, CA dentist today! In-network with almost ALL Dental PPO, Unions and HMO Plans!